One of the challenges you face while developing any PowerShell script is that modules that reside on your target platform are not available on your local computer. Just as an example, try installing Microsoft SharePoint 2010 modules on your 32 bit Windows XP/Vista/7/8 machine. It just won’t work. PrimalScript 2012 and SAPIEN PowerShell Studio 2012 now support a mechanism which allows you to do that. 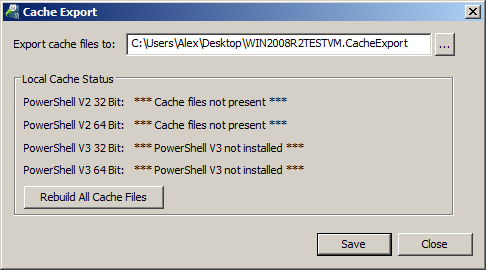 As a first step you need to get the PowerShell cache information our products use from your target machine. 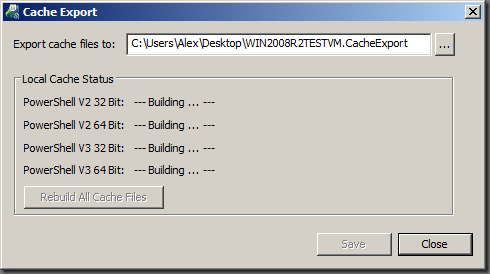 To make this as simple as possible, we packed all the files required into a zip file. It’s called CacheExport.zip and you can find that in the products installation folder under “Redistributables”. So just take that file, copy it to a flash drive, on a network share or wherever you need it to be so you can access it from your server. Note that it is not required to install the full product on your server. Unless you really want to use it there the CacheExport tool is all you need. We are using a Windows 2008R2 server as an example here. Copy the zip file to the server before unpacking. Otherwise all extracted files are marked as originating from another machine and you get a few extra dialog to acknowledge. Start the CacheExport utility. We designed this process to be installation free, so anything that needs to happen will be done by the utility. 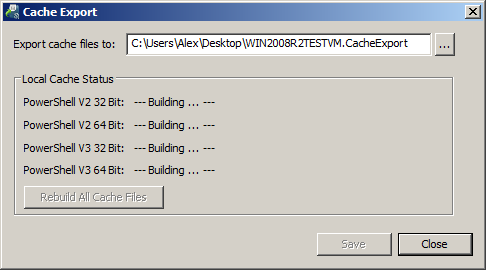 Unless you have anything else SAPIEN already installed on that machine, CacheExport will launch RegisterControls.exe. As this requires elevation you may get the corresponding prompt. Please make sure to allow it to run, otherwise this just won’t work. 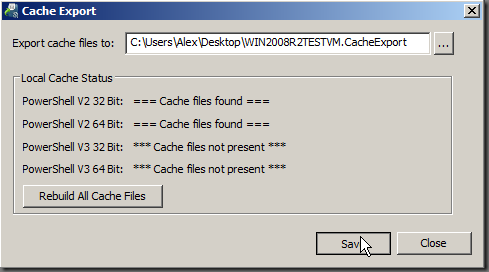 Click on the “Save” button to save the newly built cache files to an export file. The default location for this is your desktop. 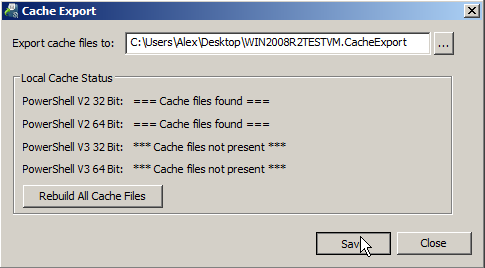 The file is named with your computers name and a .CacheExport extension. Please do not modify the name of the file, because this name is what PrimalScript and PowerShell Studio will use to find that remote machine on a network. Take that file and copy it back to your flash drive, network share or whatever location you can access from your development machine. Check back tomorrow and we will show you how to import and use this information in PrimalScript 2012. This would be awesome. Too bad every 2008 and 2008R2 server I tried to run it on generated a side-by-side error. Can’t be willy nilly installing VCC rdistro’s on production servers so was never able to try it. Most servers I know have the 2008 runtimes installed. If yours don’t there is not much we can do about it. Nothing willy nilly about it, we stay with runtimes for a long time. We could statically link but that just makes all files involved incredibly huge. My bad Alex.My use of willy nilly was a bad choice of words. I just meant that I cannot go installing VC++ distros on these servers just to get this to work so I was disappointed that I would not be able to use something this useful. BTW – These servers have Microsoft Visual C++ 2008 Redistributable – x64 9.0.30729.4148 on them. You guys are looking for 9.0.21022.8 according to the event generated. It should take any 9.0 version, but it is looking for the 32 bit version. I have made a note to investigate what we could do.